In setting new attendance records on April 5th and 6th LSC continues to grow, partly by increasing attendance by owners, managers, and staff from the production sector, and impressive industry sponsorship and support. 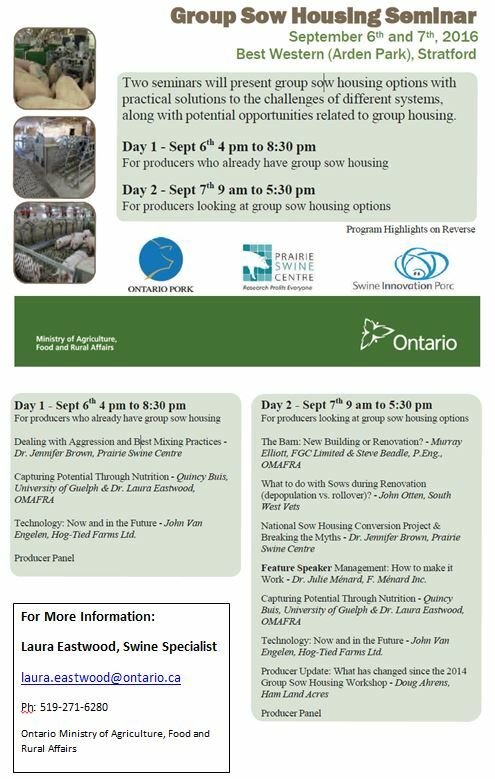 The program balances a mix of research and technical presentations with more practical topics and workshops where the research and technical topics are discussed as they apply at farm level. This is done by including producers in the planning process. For the past number of years the Conference Chair has been a pork producer, and the planning process includes a number of producers, farm managers, and many others with a background in the production side of the industry. This helps keep in focus the fact that while the research, technical, and ‘higher level’ topics are important to the industry as a whole it all needs, at some point, to be in support of Ontario pork production. We also include pork producers and production managers on the speaking program, particularly in the breakout sessions, so that others can learn from their practical experiences in doing the job every day. The written papers and summaries of the presentations provide a resource for the industry, going back to the first conference in 2001, and are freely available online at the conference website: www.londonswineconference.ca. There is also a link under ‘Highlights 2016’ to a video of a workshop by Elaine Froese on “Managing Generational Expectations”. June 16th, Woodstock OMAFRA Resource Centre 9am-Noon. Bring your ideas for our next conference, or send them to me if you can’t attend at jaydee.smith@ontario.ca. Have Your Say on Northern Agri-Food! The Ontario government wants your help to identify opportunities to grow the Agriculture, Aquaculture and Food Processing sector in Northern Ontario. Tell us your ideas on how industry and government can work together to drive growth of the sector. The Growth Plan for Northern Ontario identified the Agriculture, Aquaculture and Food Processing sector as one of eleven priority sectors that can contribute to the diversification and growth of the Northern Ontario economy. The Ontario Ministry of Agriculture, Food and Rural Affairs (OMAFRA) is developing a strategy for growing the sector and has posted a discussion paper to its website and to Ontario’s Environmental Registry. Your ideas are important to the development of a strategy for the sector. First, read the discussion paper . Then, share your ideas with us in one of several ways listed below. Comments must be submitted by July 3, 2016. On-line to Ontario’s Environmental Registry (Registry Number 012-7458). Use the ‘submit comment’ button down the right hand side of the screen. OMAFRA will develop a strategy for the Agriculture, Aquaculture and Food Processing sector based on the ideas generated at meetings and comments submitted to the ministry by July 3, 2016. The strategy, along with other plans and strategies for Northern Ontario, can be expected to drive policies, programs and investments in Northern Ontario over the next 20 years. In addition, OMAFRA will follow up with willing proponents on promising opportunities to understand how the government can help them move forward with their plans.